One of the chief reasons we appreciate comedians – and one of the major reasons that they can exert influence on us, is that they continually make us think about things in ways we have never thought about them before: everyday things, trivial things, important things, life-and-death things, all kinds of things. Towards this end, the comedian’s mind works in a very particular and fascinating way. Comedians are curious about life and how it works; they’re always searching for a different way of looking at things from the usual, always connecting together things which you wouldn’t normally associate with one another, always taking us by surprise – that’s fundamental to how comedy works. This is a generic characteristic of comedy thinking – sometimes wacky or surreal, generally coming out of left field, always inventive, creative, different – waking us up, shaking us up, getting us to question our established habits of thought and expectation. Let me say at this point that people who are funny are people who have learned how to be funny by doing this – they’ve developed the ‘comedian’s mind’. They might not have done it consciously, they might have done it at such an early age that everyone assumes that it’s a ‘gift’ – but they’ve done it one way or another. People who think they’re “just not funny” are just people who just haven’t yet developed this aspect of their potential – which, by the way, isn’t obligatory; but there are lots of other good reasons to learn about this aspect of the comedian’s approach, as we shall see. The comedian’s mind, then, is a set of mental habits, a way of looking at life and a way of responding to what’s going on around you, so that you can take advantage of the comic potential which is always lurking there under the surface. Using the comedy mind is like having a scanner going on in the background; it scans what is happening and what people are saying around you, and watches out for comedy opportunities. So the mind of the comedian, thinking this way, is always on the lookout for possibilities that other people don’t notice, because most other people are thinking conventionally most of the time – and some not thinking very much at all, preferring to watch so-called reality TV. 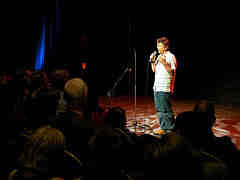 The comedian’s mind is in a state of readiness for a kind of momentary detachment at any moment. For instance, you might take literally something that isn’t usually meant to be taken literally – like Groucho Marx’s example when he quipped, “Outside of a dog, a man’s best friend is a book. Inside of a dog, it’s too dark to read anyway.” This way of thinking is involved somewhere in just about every piece of comedy material you can think of. Another crucial thing that comedians do with their comedian’s mind, while being open to looking at things differently, is to make links. Gene Perret, legendary Hollywood comedy writer to Bob Hope, Carol Burnet, Bill Cosby and others, says: “99% of jokes are two ideas tied together in a funny way.” Benny Hill provided a trademark example in his observation about looking at a very attractive girl: “Those hot pants of hers were so tight, I could hardly breathe”. It’s all about making a link between two items in an unexpected way, and going somewhere with that. We all learned to make sense of the world, when we were growing up, through learning the habit of building associations between things, and picking up on the accepted associations in our family, our society, our culture, in order to deal with what is otherwise a deeply chaotic and disturbing complexity of phenomena. For instance, we learn to associate together a bunch of things that are considered ‘good’, and another bunch of things that are ‘evil’; we associate together rain falling and being miserable, money and power, corn-flakes and milk, bread and butter, horses and carriages, and millions of other accepted connexions between things. This is a useful evolutionary process, but it can also become an overly rigid pattern or even a tyranny, and instrument of conformity. Questioning conformity is a big part of comedy’s job description. Making links means allowing the mind to wander freely, looking to create or recognise associations it can decipher, relating things to one another in unexpected ways – making different associations between things, or associating things that aren’t usually associated together. The combination you’re looking for makes that ideal blending of recognition and surprise which we know is the fundamental recipe for laughter. Making these links can be done in a number of ways: it can be based on similarities between things or on differences between things. Benny Hill’s example works by linking the quality of tightness between the woman’s hot-pants and his chest, when he tries to breathe while sexually aroused. It’s funny because when he mentions the tightness of the hot pants, we think he’s going to talk about the effect on her, but he doesn’t. When you look for this kind of unexpected link, you’re going beyond the obvious interpretation and going for something quite new. The trick is to pick up on – or perhaps almost invent – links which are unconventional – which other people haven’t thought about, or don’t normally think about, or wouldn’t dream of thinking about. These unusual associations are the key ingredient for original comedy. This ability will enable you to arrive at the unexpected thought rather than the expected – the most sought-after quality in comedians, the one that people are totally in awe of, at least until they learn that they can do it themselves. It brings one of the most prized qualities among top comedians – distinctive individuality. Actually, it’s all about freeing up your imagination, which can only be a good thing.